Brothers and sisters, this site sets forth common solutions to common computer backup situations. The information covered herein will apply to the vast majority of computer users. But verily there are specialized situations in which it's necessary to "think outside the box" and come up with creative solutions to unusual backup situations. Here's where you can take the wisdom you've been taught by the Backup Nut to create your own novel solutions to thorny backup problems, whether for yourself or for your own flock of backup converts. Can I get an amen? Here are some examples of specialized backup solutions for unusual situations to seed your thinking and meditation on the verily diverse snares and tortuous roads you may someday walk in your battle against the evil of computer data loss. 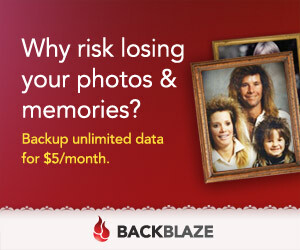 As I have mentioned before in pages past, it has been revealed unto me that affordable online backup is an anointed backup solution for many of my flock. has the Backup Nut's blessings, glory be. But what happens if you (or your disciple) is burdened with a slow Internet connection or evil bandwidth caps? Verily, it's not enough to shout from the nearest mountain top, "Get thee behind me, evil ISPs with thy bandwidth caps, which surely hail from the pit of perdition!" That will feel good, glory be, but it verily will not solve your problem. But if you happen to live next door to (and within Wi-Fi range of) a brother or sister in the faith -- one whose eyes have been opened to the evils of data loss and who is willing to join with you in the struggle to prevent it -- there verily is a way that this can be done. Again, you will need a strong Wi-Fi signal between the two homes to make this work. What you will need is a wireless router and a wireless backup drive. Once you have your router configured with a strong WPA key following the manufacturer's instructions, configure the wireless backup drive to your router and install the backup software. Once you test the setup to make sure it works, shut down the drive in a decent and orderly manner, carry it to the home of your brother or sister in the faith, and set it up in an anointed place where you can get a good signal from your router. Once you're sure that the connection is stable, glory be, you can verily make your backups over the wireless connection. Putting your backup drive in your neighbor's home will protect you from loss of the backup drive in the case of, for example, a fire at your home. It will not protect you from large-scale disasters such as a forest fire, flood, or other catastrophe that could involve your neighbor's home as well as your own; nor will it protect you against theft of the drive. You should verily encrypt your backup if you choose this method, and make sure you store the key or password in multiple safe locations. Many people have truly staggering amounts of data to back up, glory be, but most of it consists of stuff that doesn't change. For example, you may verily have 100 gigabytes of pictures and videos of your children or grandchildren that you wouldn't want to lose, but your slow connection or the bandwidth caps imposed by your evil ISP (Get thee behind me!) make online backup impractical. However, you only add a few new pictures a month to your collection. Here are two possible solutions for situations like these. The first option is to choose an online backup provider that allows you to "seed" your initial backup by mailing them them the first backup on an external hard drive. Then only the new files you create (or changes to any existing ones) will need to be backed up online. This will eliminate the long "first backup," and also will help you avoid running into your ISP's bandwidth caps. A second option is to use a hybrid backup strategy. The way this works is that you move all of your old stuff that doesn't change into its own folder, and then copy that folder to an external hard drive and store it in a safe location other than your own home. This could be a relative's safe, perhaps, or a bank safe deposit box. Then when you set up your online backup, exclude the folder containing the "old stuff" so it won't be backed up online. This way, only new or changed data will be backed up online, verily reducing your bandwidth usage. To use this method, you'll verily need two backup devices, such as external hard drives, and some sort of portable storage device like a flash drive. 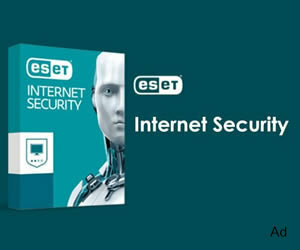 You'll also need backup software capable of creating incremental or differential backups, glory be, and access to a computer somewhere else, such as a relative's home or your place of business. We'll call that place your "second location." To start the process, create a full backup image to one of the external hard drives. When it's done, copy that backup image to the second external drive, and carry the second drive to your second location. From that point on, allow your backup software to create incremental or differential backups to the hard drive connected to your computer, and copy only the incremental or differential backups to your flash drive, which you will then carry to your second location and copy onto the second external hard drive. Of course, whenever you make a full backup, you'll have to carry the hard drive to your second location and copy it over to the second external hard drive. The solution that The Backup Nut uses for local backup is an ioSafe Disaster-Proof Hard Drive that verily looks like the one in the picture here, glory be. These drives are certified by their manufacturer to be both fireproof and waterproof, and also come with a renewable data-recovery warranty. What that means, brothers and sisters, is that even should the drive inside the enclosure be damaged (for example, from being jostled around by firefighters), ioSafe will pay to have the data recovered from the drive up to the limit of the warranty coverage. 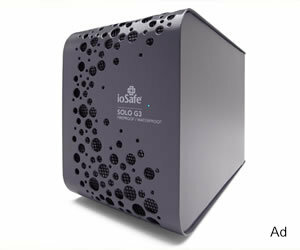 If your location is such that you don't have fast Internet, or if you have data caps that make online backup impossible, then the ioSafe disaster-proof drive is the closest local solution that you'll find to the security of online backup. I use one of these drives myself (along with Macrium Reflect backup software), and and highly recommend them to you, my dear flock. It's impossible for the Backup Nut to predict every possible scenario in which you, dear brothers and sisters, may be called upon to fight the evil forces of data loss. But be of good cheer: With the wisdom you now have, you can construct a backup solution for almost any situation. It may not be pretty, glory be, but you can make it work. The most important thing is that you are believers -- you have seen the light of data protection and have chosen it over the darkness of eternal data loss. So now I commend you to go forth with the Backup Nut's blessing, and spread the message of backup to those who still walk in ignorance of data loss. Preach this message and practice it every day: and then, even as you walk through the valley of the shadow of hard drive death, your data will verily be protected from perdition.